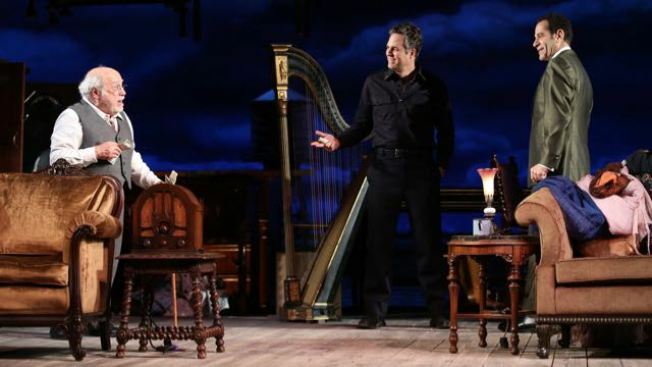 As brothers, Mark Ruffalo and Tony Shalhoub have a lot to harp on. The nudgnik appraiser in their midst, played by Danny DeVito, isn't helping matters. Below, Ruffalo and Jessica Hecht. “The Price,” now at the American Airlines Theatre, is an infrequently produced Arthur Miller drama with its focus on a New York City cop nearing age 50 and contemplating retirement. 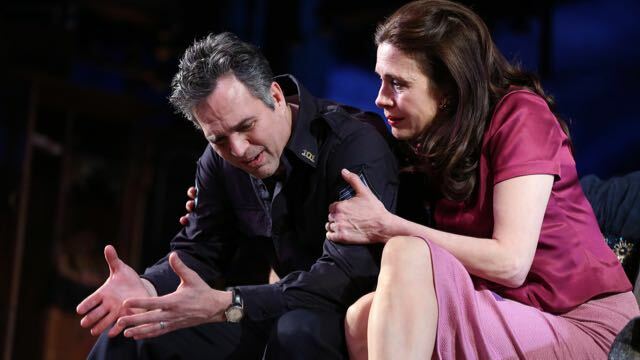 Mark Ruffalo is Victor Franz, the play’s emotional center, who is worried he lacks the fortitude for a career switch after years on the force. Amusingly, Ruffalo co-stars here alongside TV icon Danny DeVito, who at 72—speaking of job changes—happens to be making his Broadway debut. Our setting for “The Price” is autumn, 1968. Victor has asked wheezy Jewish appraiser Gregory Solomon to his abandoned family home, to see what value there may be in the dusty furnishings. There’s urgency, because the building in which the attic apartment is located will be torn down in days. Victor and Gregory start negotiating a price for the possessions, but are interrupted by Victor’s estranged sibling, Walter (Shalhoub). The brothers haven’t spoken in years; the reasons tie into a family sacrifice Victor made during the Depression—that’s the double entendre in Miller’s title: Everything has its price. Ruffalo is earthy and resigned as the dedicated civil servant who’s long walked a monotonous beat in the Rockaways. He’s no pushover, but he believes Solomon is giving him a fair shake. His is an even-keeled and sad performance, without histrionics. Ah, but you want histrionics? DeVito, as a streetwise and mentally spry old man, is obviously tickled to be on this stage. Like Victor, Solomon is at a career crossroads. The goods he might acquire from the Franz family estate could reignite his own professional prospects. But his authenticity and honesty are doubted by both Walter and Esther (Hecht), Victor’s wife. DeVito’s performance bursts with comic energy, notably when he decides in the midst of negotiations to pull a hardboiled egg from his briefcase, cracking it open with his cane. The succeeding minutes of propulsive spittle could well be marketed as Theatrical Lipitor. Do you want an egg? I do not ever again want to see an egg. Shalhoub’s motivations as Walter are the murkiest. He arrives, lordly and full of grand gestures, prepared to let Victor keep whatever proceeds he might have some claim to—hail, the return of the accomplished doctor! But Walter is soon off speaking of his own hardships, a divorce and an institutionalization. He turns spiteful. Hecht, too, takes us on a journey. As Victor’s defeated wife, she’s hidden the shame that her husband couldn’t provide for her the way she desired, and she sees this potential windfall as a chance to move up in class status. I was prepared to write Esther off as a gold-digger, but a simple gesture involving her husband’s uniform made me reevaluate assumptions. Derek McClane’s set is a surreal panorama of urban water towers and shrouded armoires. I can see why “The Price” isn’t staged as frequently as the Miller classics. The second act spins into an exhausting cyclone of old slights and misunderstandings to justify the silences between siblings. Director Terry Kinney does his best to keep things reeled in, but some of the interaction between the brothers borders on tedious. “The Price” is best described as dyspeptic. If you’re looking for a hero or a villain, it’s an irresolvable conundrum—you can find evidence that it’s any of the four. That said, in the hands of a quartet as skilled as this, what we’re left remembering finally is not Miller’s art, but something of a master class in great performing. “The Price,” through May 7 at the American Airlines Theatre, 227 W. 42nd St. Tickets: $69-$169. Call 212-719-1300.